Appointment completes management team says CEO James Sturrock. Imports of foam and sprung mattresses combined are on the rise. Mike Marshall (left) with Millbrook Beds sales director Mark Hughes. South Coast bed maker Millbrook has named well-known sales agent Mike Marshall as manager for Scotland as it looks to expand its customer base across the UK. Harrison Spinks has since launched TV advertising for the first time. Sales and profits advanced for Harrison Spinks Beds ahead of it making its TV advertising debut this Christmas, but it was the Leeds group's components division that delivered the biggest uplift in performance last year. Beter Bed, the pan-European mattress and beds retail specialist, claims it has become the first to launch a completely circular box spring, saying its new Element programme is fully-recyclable. 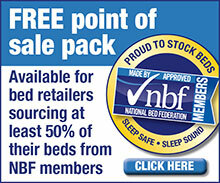 Consumers are buying beds more often, says the NBF. Major chemicals supplier Dow is investing in new machinery at its research and development facility in Switzerland which it says will put it at the forefront of comfort innovation for the bedding industry. Casper Sleep, the U.S. headquartered mattress and ancillary sleep products business which additionally launched in the UK in 2016, has raised $100 million in a new equity funding round. Vacuum-packed mattress maker Breasley has invested £300,000 in new CNC foam cutting machinery that it says will allow it to produce faster and in greater quantities. Hypnos said revenue grew in line with its business plan. Higher cost-of-sales weighed on Hypnos profits in 2017–18 with the Princes Risborough bed maker outperforming the wider market after sales grew in both its principal business units. Boss of UK/Europe of past three years moves on for emerging mattress business. Both the volume and value of mattress and bed base sales by British and Irish manufacturers declined last year with business optimism also falling, according to new data from The National Bed Federation (NBF). Mattress imports inched ahead in the first month of 2019 as the three largest sources of foreign-made goods for the UK market countered weaker figures from other countries. Beter Bed closed a net 150 Matratzen Concord stores in Germany, Austria and Switzerland. A mid-year decision to cut store numbers cost the Dutch based mattress retailer Beter Bed Holding heavily as it booked a €23.3 million net loss for 2018. Tempur Sealy International has submitted a stalking horse bid for the assets of one of its biggest customers, a 142-store American mattress retailer that filed for bankruptcy protection last month. The National Bed Federation (NBF) has launched its free-to-download marketing toolkit for retailers to use ahead of National Bed Month, which runs throughout March. Southern England independent retail chain Beds Are Uzzz is stocking a bed-in-a-box brand for the first time after agreeing a tie-up with Yorkshire based Otty Sleep. Silentnight, Britain's largest bed maker, has opened a third brand showroom and its second in the south of England. Dewsbury manufacturer Shire Beds has formed a headboard-making unit within its West Yorkshire factory after deciding to take production in house. MattressOnline, one of Britain's largest online pureplays, says it is on track to return to growth in 2018–19 with its focus on margins and working smarter. Bed manufacturing giant Tempur Sealy International and Mattress Firm, which was until 2017 its largest customer, have agreed to a stay of proceedings in their ongoing legal dispute.